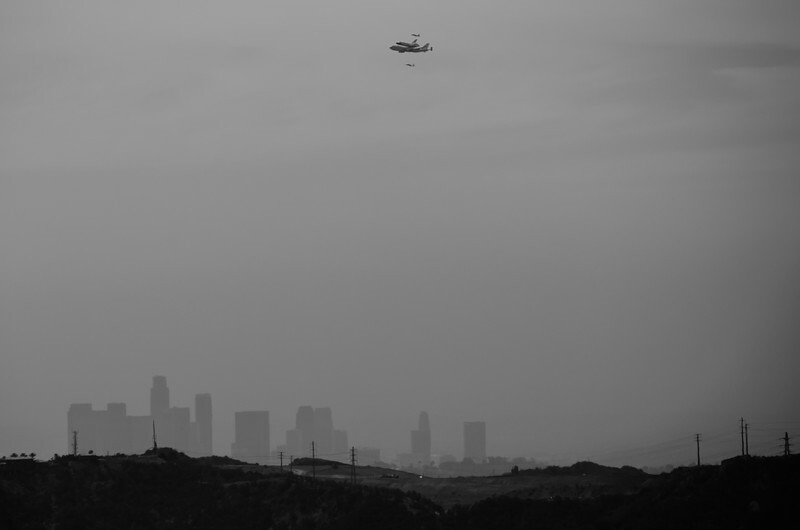 Another photo from yesterday's Space Shuttle Endeavour flyover of Los Angeles. Although there were blue skies directly overhead, the haze in the distance sucked the big one and drained much of the color from the above scene. So...I went ahead and stripped out the rest of the color and converted the photo to a black and white shot in Lightroom and then gave it a crop. Nothing great, but mildly interesting with the old time newspaper feel. And, yes, that's the mighty downtown L.A. skyline as seen from the hills above JPL on the Pasadena/La Canada-Flintridge border. That's the Santa Monica Mountains in the foreground (aka Hollywood Hills) and that big bald patch is the old Toyon Landfill. The tallest building is the U.S. Bank Tower, which cinematic-minded readers will recall got a giant laser beam up the kazoo by the big bad UFO in "Independence Day."